Many marketers confuse explainer videos and product demos - they are very similar but have a few key differences. Explainer videos showcase your solution to the customer's problem, but explainers don't showcase your products in-action. Enter, product demos. Product demo videos showcase how your customer accomplishes the solution with your product. The product is the focus, as opposed to the solution - both videos are essential in the sales funnel. Since product demos are a part of the consideration stage, the potential customer is already interested in your product or service, so the video length can be a bit longer than awareness-level content. The format should be pretty simple - keep them to-the-point, walk your audience through the action, provide contact information, end of. Knowing your target audience is the key to producing successful product demos. Your product may be used in a particular way by certain people, but offering alternative ways to utilize your products can seal the official deal. Utilize your product demos to simply tell a story that your audience wants to hear - repeat what brought your potential customer to this point in the sales cycle, speak to their experience and needs, and emphasize the solution, all while demonstrating the use of your product. You have an intimate understanding of how your product works, and know all features/benefits inside and out, but demonstrating what people need to know in front of a camera takes preparation. Your videos require structure so the information that you want to portray, is delivered in an effective way. And preparation means scripting! When writing your script, seriously consider what functions you would like to demonstrate, and the order in which they're demonstrated. And from the script, you can gather your shot list, which helps both production and post-production move much smoother. If you don't get to the point quickly, you're likely to lose your audience. So, keep it short and simple. Capture their attention quickly by tapping into a need, fear or problem at the beginning of the video. And you probably think you could create a 30-minute video on the specifics of your product, but keep it tight. So, don't try to pack in 30-minutes worth of content in a minute-long video. Approaching your video this way, will overwhelm the viewer and decrease the retention of information. When you delve too deep, you run the risk of muddling the message and confusing the viewers. Instead, explain one feature of the product at a time. And ensure that the features you focus on provide the solution to the consumer's problem. 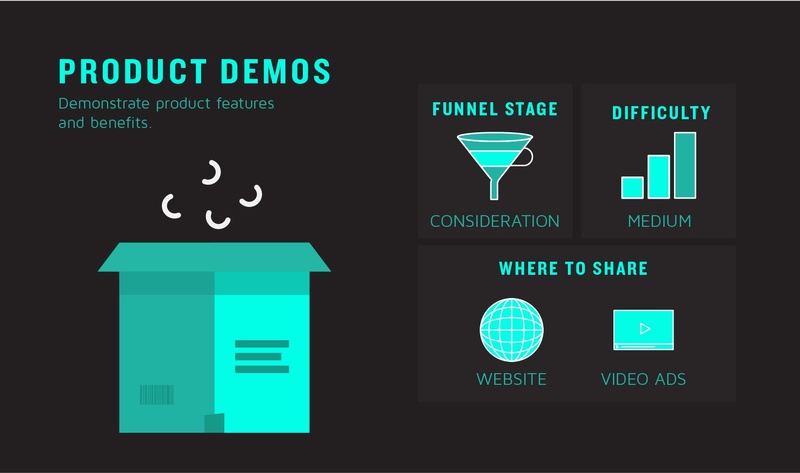 Think of your product demo video as an intro to your product, and not a full-fledged explanation. Your viewer can get the introductory, basic features that solve their problem. Then, you can utilize CTAs to push them further down the funnel to consume more content, and learn more about your product or service. So, your audience knows the introductory features, and how your product can help solve their problem, but now what? Unless you prompt further action, your viewer will not know what to do. Your product demo videos need to have a clear CTA.